Samsung first launched the Galaxy Tab E 8.0 in January 2016, but the company came up with a refreshed version of the tablet the following year, with the only notable changes being the jump from Android Lollipop to Android Nougat out of the box alongside 32GB of onboard storage, twice the amount available on the OG model. 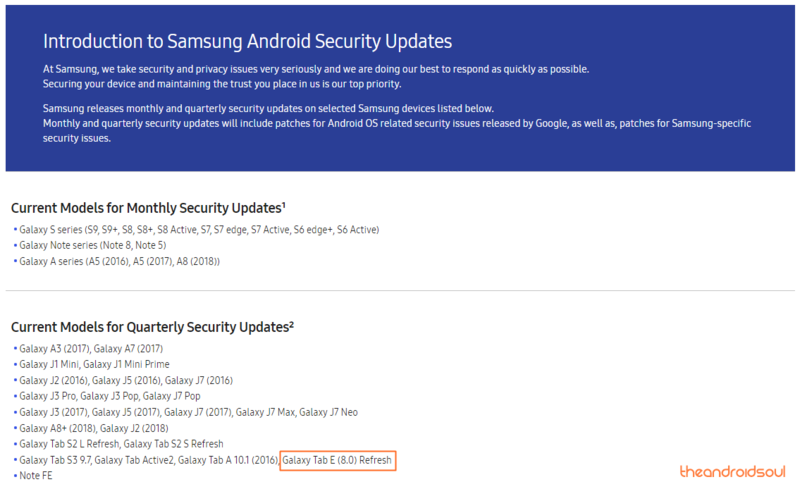 Now, Samsung is showing some more love to owners of the refreshed Galaxy Tab E 8.0, where it has added the tablet to the list of devices that will be receiving quarterly security updates. While many would have welcomed monthly updates, it’s still better than being forgotten like users of the 2016 Tab E 8.0. Despite the good gesture, Samsung hasn’t said a thing about Android Oreo, but we do know T-Mobile’s refreshed Tab E 8.0 will get Oreo. The OS has already been rolled out to the Galaxy S8 and Note 8 and the next in line are the Galaxy S7 and Galaxy S7 Edge, which, if the latest developments are to be considered, should start receiving the OS very soon.